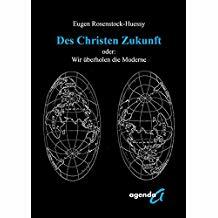 by Eugen Rosenstock-Huessy as The Christian Future, or The Modern Mind Outrun. Translated and revised by Christoph von dem Bussche and Konrad Thomas. Siebenstern Taschenbuch Verlag, 1955. Reprinted in paperback by Brendow Verlag, 1985. This edition has a preface by J. H. Oldham. For a description, see The Christian Future.